The young woman walked hurriedly along the dimly-lit street near Zeehan in Tasmania, because she heard the sound of footsteps behind her, but a masked man pulled her into the scrub and attempted to assault her. Only 21, she bravely fought him off with her hat pin, which snapped in her hand. Luckily, her sister and brother lived nearby. They heard her cries for help, and they raced to her rescue, so the man ran away. This incident occurred in 1913. 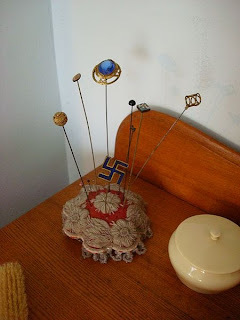 It is just one of the many cases in which women defended themselves against attacks with their long and sharp hat pins. Unfortunately, women may have found this difficult after a fracas arose in countries all over the world about the menace of hat pins in public places. Several people were injured by hat pins, which could be up to 14 inches long. Even the Australian Federal Attorney-General was injured by a protruding hat pin in 1912 under his eye, and this caused a long gash on his face. Byelaws were passed by councils in cities worldwide, including Sydney. Fines were issued to women who refused to place protectors on their long and fashionable hat pins. Hat pins were actually taken away from suffragettes who went to jail in Britain, in case they used them as weapons. Authorities in Stockholm in Sweden solved this problem in an innovative way. Conductors of street-cars in the city offered ladies with menacing hat pins point-protectors at a cheap price. 6000 were sold out in a single day!